I have been reading a lot of the forum material over the last month and am starting to form a few options for my first set of skates. First off - thanks to all of you for the time you have put into this forum – I love the passion! Reason for skating: 8 yr old daughter is in love with the activity... and it’s been a lot of fun for me too! Reason for wanting skates: Desire to improve and rentals are making me mad!!! Rink right now, but I want the option to go outside (parking lots/trails etc) with the same set of skates, of course different wheels. 1. Bont Quadstar or Prostar – I tried on the Prostar’s and really like the fit. The 8’s were a little too short, but I like how tight they were on my foot, the 9’s were better at the toe but I was worried about “vinyl” stretching and being too lose down the road. a. Looking for an opinion on size. If I measure, the Bont site tells me I am a 9 Narrow (very last mm limit of 9)...since these two options don’t come in narrow I am thinking about going with an 8.5 (haven’t tried them on). b. Does anyone think I could reverse mount these down the road if I wanted to? 2. Vintage Riedell 265 on Nova plates – reverse mounted. I haven’t tried on the 265s – think I am a 9.5 in Riedell’s (I rent a 10). I like the look/durability and the heel for outdoors (based on some of the opinions on the forum). a. Do the older 265’s fit the same – meaning if I measure using the site’s guidance, would they size the same ? “9.5 current version” = “9.5 vintage version”? Last question: Are there any really good summary technique posts/videos (in this forum or otherwise) I should look into to get started on improvement path? Well, for starters, skating with your daughter, you really don't need "top of the line" skates. Yes, they're nice to have, and yes, they generally do last longer, but for one who is currently skating at a rink, almost anything will do. Just DON'T get Chicago's! In your price range, there are quite a few skates available. A good set of outdoor wheels are Moxi's. They're only around $50-70 for a set of 8, have a good durometer, and as long as you remember to rotate them, should last a while. Boots, however, don't really matter as much. However, the Moxi skates (mostly bright colors and some "animal print" vegan-friendly ones) are actually built for outdoor skating and - of course - can be used indoors as well. The plates they come with are typically much more sturdy than a traditional indoor skate. The lower end ones are in your price range...and you can order them from your rink ('tis the season! A lot of rinks often have skate sales this time of year). Ultimately, the brand/style you get really comes down to what YOU like. You can always adjust your plates, change your wheels, stops or toe plugs (or go without), etc. There are quite a few experts on here who recommend various ones, but these are people who often don't have quite as limited of a budget as most of us...and that's great, for them. You could easily spend $100 on skates and an extra set of wheels, or you could spend thousands (wish I had the cash to get the ones I REALLY want!! )...but it truly does come down to what pleases you. Have them measure you at the rink, whether you actually buy them from the rink or not...get a range of sizes (some rinks often have skate brand specific measurements as each brand can be slightly different)....then...pick which ones you like in the size you like. If you're a half size in the ones you like, get one size larger. You can use lamb's wool in the toe for a better fit if needed. As for vinyl boots stretching, I got my one and only pair of vinyls when I was 12...and used them until I was in my 30's! Sadly, they got water damage or I'd still have them now. I never had a problem with them stretching over time...though leather is much more comfortable and they "breathe" better, leather, of course, is more expensive than vinyl or any other "man-made" type. The biggest thing to remember when getting skates - no matter what brand or where you eventually buy them from - PLAY with them! Check this link for the parts: https://s-media-cache-ak0.pinimg.com...bf506cf07f.jpg You won't necessarily need the toe guard, of course, but that's all the parts and where they go. Anyway, a skate should NEVER be skated "straight out of the box". Make sure all the bits and pieces are screwed on properly (toe stop/toe plug, the wheels, and the action nut) and reasonably tight. The last thing you want is to put on your new skates...and fall because a lock nut fell off and your wheel rolled away! Bring your tool(s) to the rink. Hit the floor and try a few laps, crossing over, doing some serious turns and stops (if you're up to that point yet), etc. Then adjust the parts as needed. With a fixed toe stop, you're kind of out of luck, they are what they are, but with an adjustable, try moving it up or down a bit to see what you like. Loosen and/or tighten the action nut a bit (this controls how easy it is to turn)...skate a few more laps...adjust so it's comfortable to YOU. Also remember, there should be SOME play on the wheels - you crank them down too much and you'll be walking instead of rolling (and possibly damaging the bearings! )...too loose and the axle can get stripped and the lock nut - and your wheel - will fall off...so you do want to play around a LITTLE with the wheel, just not as much as you would with the action nut or an adjustable toe stop. As for videos...there are HUNDREDS on YouTube, so it really depends on exactly what you're looking for. Look them up by subject...from basic "How to Roller Skate" videos to "How to Backward Skate", they've got them...and many more! Richard aka "Armadillo" is no longer with us. As for your budget. Heres some helpful ideas. Use Tee nuts to mount. Used set of Atom Poison slims (62x38) for outdoor use. (25-40$) If you can't find slims , normal poisons will work just fine. This is all to save money for the part that isnt good to go cheap on. The plate. SURE GRIP Alu Avenger is a great starter plate. Adjustable pivots, good 8mm axles, VERY DURABLE baseplate. They have a good deck height to avoid wheelbite as well. For a size 9 foot, I would be looking for a 180mm(size 5 in the SG AVENGER line) wheelbase, most people consider it too long for your foot,. 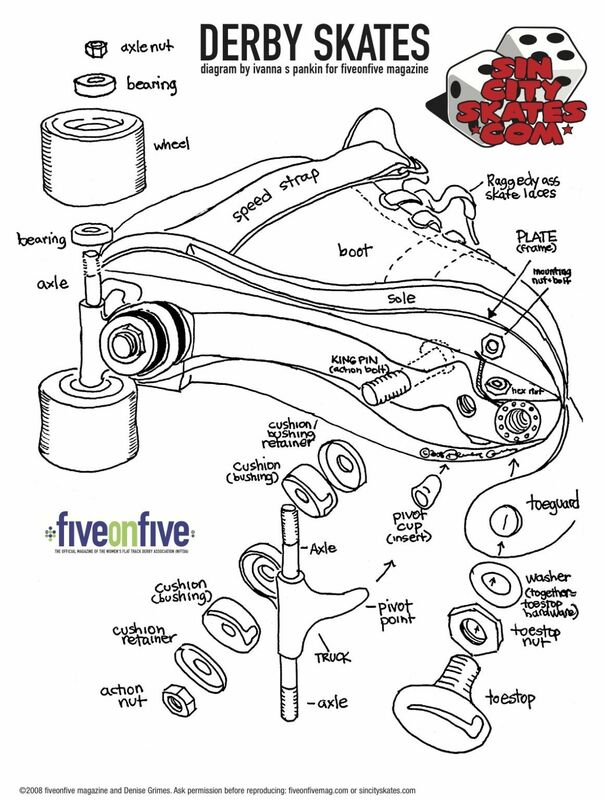 But for a new skater having a comfortable stable and forward axle placement is key for confidence IMO. Also since this will be used outside the farther forward the front axle the better. It definitely helps navigate over debris easier when you have weight shifted to your heels for rougher terrain. Out of town last week so just catching up on responses. I put in an order for Bont QuadStars at a relatively local rink. The gentlemen gave me a really nice price, so I went for the leather. ...after measure/re-measure/re-measure rinse/repeat I realized the print out I used off the Riedell site to measure length was not a good idea. Accurate measurement using heel against door frame, a piece of paper and a tape measure aligned with my "feelings" relative to what I had tried on. Anyhow, I ended up ordering a pair in 8.5. Will be picking them up Friday, so we'll know then if I got it right! Mort - Thanks for these details...I considered building myself as you suggest but when thinking through my obsessive nature combined with my ignorance of proper skate response I felt like building on first pair was just too much. I will file this for next time/next pair. For reference, I think the skates I ordered come with 175mm plates but the guy at the shop told me he would swap them out if I wanted longer plates. The turning can be tuned out of the plate if you find it "over responsive". This makes a ton of sense to me, and I am guessing you cant go the other way. RBT = Roller Bones Turbo? 7Skaters - Chicago's avoided. Really appreciate your "PLAY with them" advice. I will do as you outline. Very helpful diagram. All - Wheels - I ordered a pair of Pacer Velocity wheels for outdoors but also need a pair for my daughter. The lime green isn't going to go with her future mint green vanilla's so I will look at both the Moxi's and the Atom Poison's (pink)... Anyone have a used set of either? I have been skating awhile and taking lessons from a good instructor but still watch these videos looking for pointers and inspiration so thought you might be interested. Yeah, Joe Enthor's vids are really helpful. Thanks. Depending where you skate outdoors will determine what kind of wheel profile would best suit you. Cosmic superflys are another good outdoor wheel for smoother terrains. I wouldn't go to a 78A softie unless you have some crappy areas youre skating. Even then it would be for comfort. Rougher terrain will want not just a softer wheel, but a thicker amount of it. You can take low kingpin angle plates and make them turn as well, or make them bricks. There are lots of ways to set up suspensions. Also wheels will have a significant influence on how a skate handles. With a simple wheel swap, you can go from "turns O.K." to "holy crap!" The best example of this would be moving from say a 98A SG Zombie LOW wheel(59×38) to a softer 88A Rollerbones turbo (RBT). The hub in the zombie runs the ful width of the urethane, and the wheel is squared up on the edfes, so there is no "lip". This makes it good for high speed skating, but does not turn all that well. Where the RBT example here is a softer urethane and has a lip, with a hub that does not run the full width of the wheel. The lack of support on the lip allows the edge of the wheel to deform easier, and it helps the skate carve more sharply. Combining that mid level firmness urethane and a wheel with those build characteristics really lends a hand to the skates overall agility. The Zombie example pretty much makes the plate do all the work. Not a lot of deforming will happen at that urethane hardness and a hub that supports the urethane all the way to the edge tops it all off. Coming up on a year since your last post. How's the skating going?